Amo Jones: Razing Grace OUT NOW!! This story is twisted. It’s about love that has nothing to do with love, not n the sense that people usually comprehend it. It’s about pain, darkness beyond pitch black. And it ends with a goddamn cliffhanger! Millie is taken, to be used as means to an end. But before she can be used, she has to be broken into million pieces, all that she was and believed in, gutted out of her. And what scares her most, there are moments, when she actually likes it. Her journey back borders insanity in so many levels and when she finally gets back home, she has gone through a change that is irrevocable. Raze, also known as Tripp, has been raised to play the role of the executioner. The sick mind of his father has forged him into a machine, that craves blood. He can kill a human in hundred different, agonizing ways without even breaking a sweat. 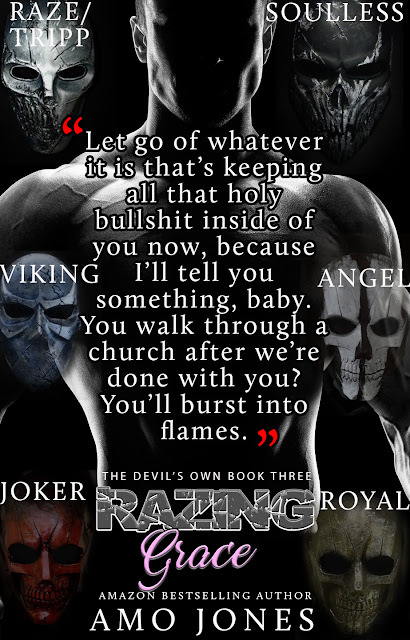 Raze knows no love, his life is fueled with hatred and power he holds over people. Then along comes Millie, the one he’s supposed to use only as tool to execute his plans of revenge. And even shattered, robbed of her light, she’s able to make Raze feel something. 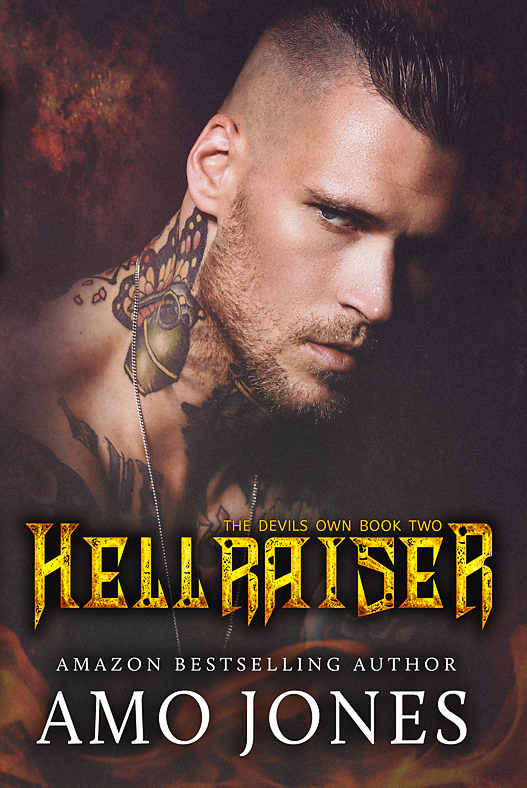 Their relationship is intense, unrelenting, wicked and hotter than hell. And I cried when I read this book, but the tears were not for Millie, no, they were for Miles. I fell for him, hard, and now my heart grieves. This book… I probably shouldn’t have loved it as much as I did. I’m scared of myself, how I cheer along the Raze, Joker and Viking when they’re satisfying their need for blood. And I felt the same thirst clenching my throat. And that just tells me how good of a writer Amo Jones is. Amo Jones definitely made me wheel a whole range of emotions and once I started reading, I couldn’t put the book down. 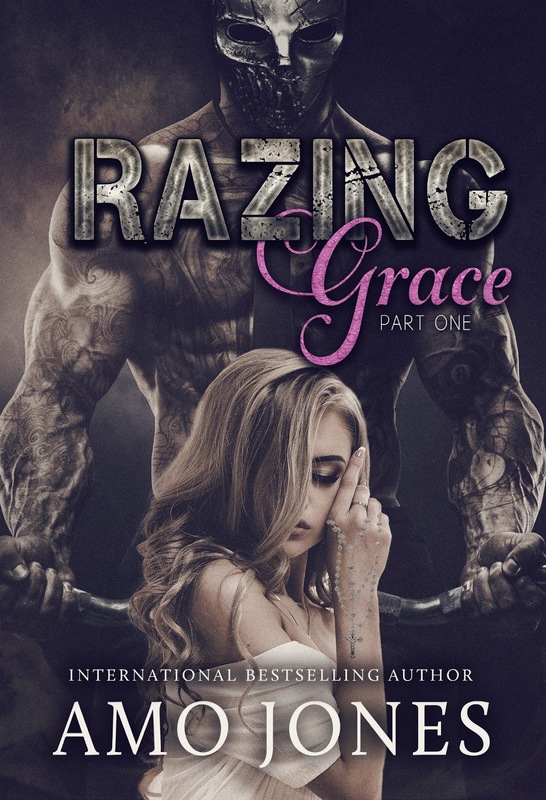 Razing Grace takes you on one hell of a roller coaster ride, that plunges deep into darkness, beyond the gates of hell, before returning to dusk never turning into dawn. 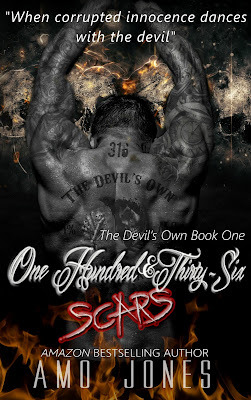 Previous PostWilla Thorne: A Sacred Vow COVER REVEAL! Next PostAmo Jones: Razing Grace GET YOURS NOW!